A wake is a social gathering associated with death, usually held before a funeral. Traditionally, a wake takes place in the house of the deceased with the body present; however, modern wakes are often performed at a funeral home or another convenient location. A wake is also sometimes held in place of a funeral as a social celebration of the person's life. In the United States and Canada it is synonymous with a viewing. It is often a social rite that highlights the idea that the loss is one of a social group and affects that group as a whole. The term originally referred to a late-night prayer vigil but is now mostly used for the social interactions accompanying a funeral. While the modern usage of the verb wake is "become or stay alert", a wake for the dead harks back to the vigil, "watch" or "guard" of earlier times. It is a misconception that people at a wake are waiting in case the deceased should "wake up". The term wake was originally used to denote a prayer vigil, often an annual event held on the feast day of the saint to whom a parish church was dedicated. Over time the association with prayer has become less important, although not lost completely, and in many countries a wake is now mostly associated with the social interactions accompanying a funeral. It used to be the custom in most Celtic countries in Europe for mourners to keep watch or vigil over their dead until they were buried — this was called a "wake". This is still common in Ireland and North-western Scotland. With the change to the more recent practice of holding the wake at a funeral home rather than the home, the custom of providing refreshment to the mourners is often held directly after the funeral at the house or another convenient location. 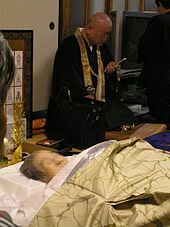 The wake or the viewing of the body is a prominent part of death rituals in many cultures. This ceremony allows one last interaction with the corpse, providing a time for the living to express their emotions and beliefs about death with the deceased. ^ a b  Ivan Brunetti; Wilton, David A. (2004). Word myths: debunking linguistic urban legends. Oxford [Oxfordshire]: Oxford University Press. ISBN 0-19-517284-1. ^ Harland, John; Wilkinson, T. T. (1873). "Pageants, maskings and mummings". Lancashire legends traditions, pageants. George Routledge and Sons. pp. 123–124. ^ Lysik, David; Gilmour, Peter (September 1996). Now and at the Hour of Our Death: Instructions Concerning My Death and Funeral. Liturgy Training Publications. p. 28. ISBN 1568542860. ^ Hoy, William G. (2013). Do Funerals Matter? : The Purposes and Practices of Death Rituals in Global Perspective. Taylor and Francis. p. 108. ISBN 9780415662048. Retrieved February 18, 2018. Wikimedia Commons has media related to Wakes (ceremonies). Ripley, George; Dana, Charles A., eds. (1879). "Wake — In Ireland" . The American Cyclopædia. Chisholm, Hugh, ed. (1911). "Wake" . Encyclopædia Britannica (11th ed.). Cambridge University Press.